What if pain, failure, hurt, loneliness, shame disappointment, doubt…. All those words, all those experiences were redefined – Given new meaning. They are real, these feelings and experiences are true but they are not where hope is found. Hope is not on “the other side” and being rid of them or being “over it” but what is hope is in the midst of it all – it’s scary but the hard stuff is there no matter what. We can’t escape it and when we avoid it we sink deeper into it. We do this work as therapists not because of the pain but because of the good. The hope. The restoration. It’s as real as the hurt. What if these experiences were not a sign that we are broken and need to be fixed but a sign that we are human and that is important because that means we are not alone? You are not alone. 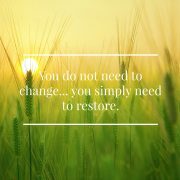 Maybe it’s not that you or your life needs to change maybe it means that you need to restore…and restoration needs community. We need each other to heal. Healing, hope, love, belonging they are not ideals that we find when get “it” right. They are what we discover when we stop hustling and hiding and say, “I’m not ok and I don’t know where to start but I am tired and I need some help” That’s where we come in. That’s where your story matters because the characters and context will be different between us but the experience is one we all share. We are human and that means life is hard and sometimes it hurts, a lot, but it gets better. None of us are called to do this work alone. That’s why all of us here became therapists and come to work with joy and gratitude each day. You do not have to do this alone. That’s why we’re here. There is good in the world and in each of us but it is gritty and hard, messy and confusing at times and that’s what makes us, all of us, and this life so beautiful. Your story matters and we want to hear it. It matters not just to you but to us. It reminds us that we are all in this thing together, doing the best we can but we can’t (and shouldn’t) do it alone.